I was lucky enough to be invited to the launch night of The Chilli Pickle in Guildford. 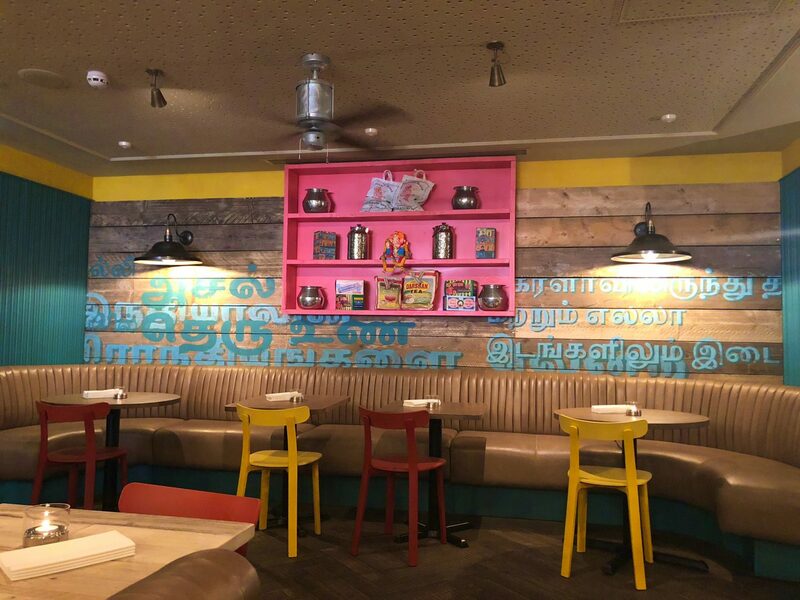 On the streets of the upper high street of Guildford you certainly cannot miss this vibrantly coloured Indian restaurant and it has the interior to match. 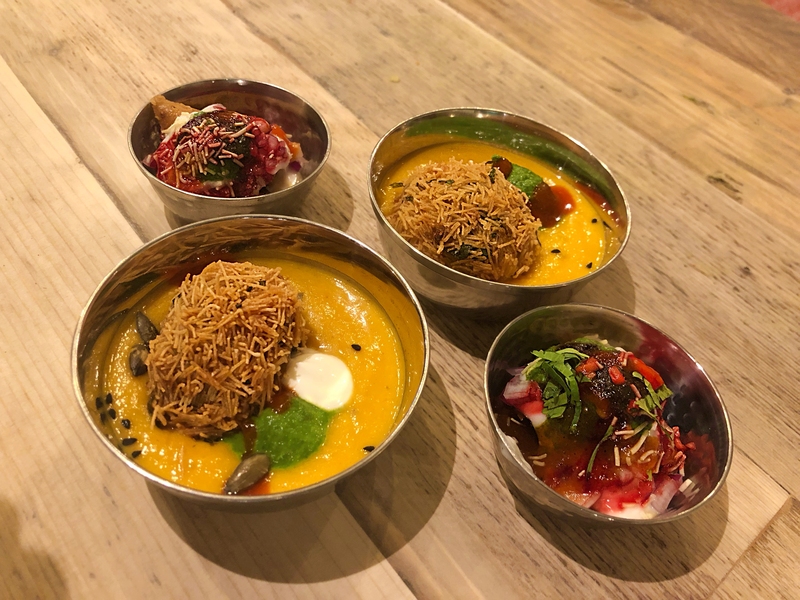 The opening of Indian restaurants aren’t exactly regular occurrences so I was pretty ecstatic to see that the newly refurbished restaurant wasn’t just going to be another cuisine that we already have. So who are The Chilli Pickle? 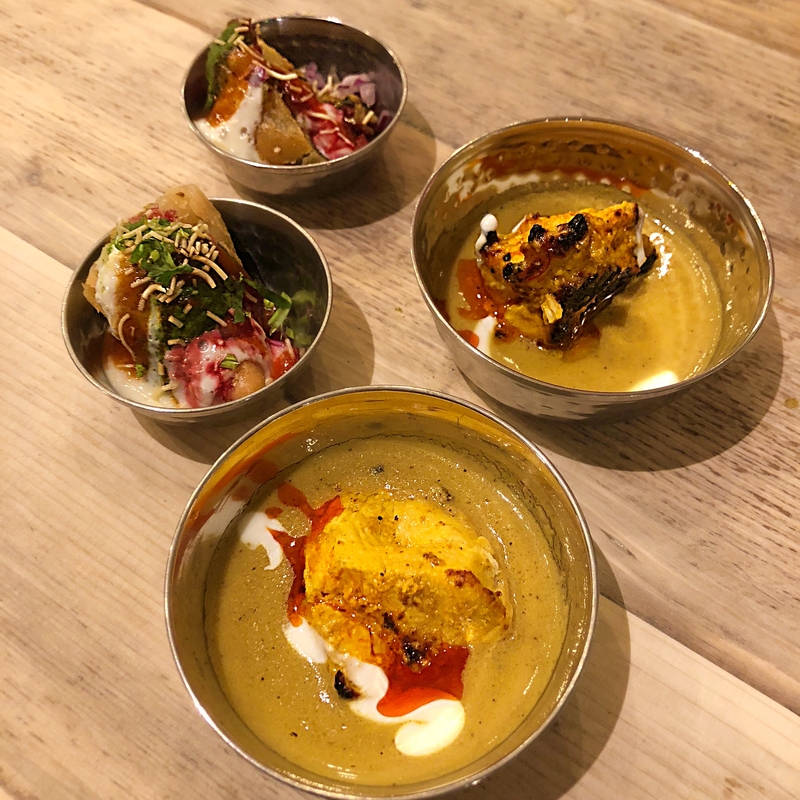 Well the very first was opened in Brighton with the aim to offer an authentic and accessible Indian dining experience that echos the vibrant energy of India. Celebrating ten years, the Guildford restaurant will hopefully follow in the footsteps of the multi-award winning Brighton flagship, which has earnt national recognition following since 2008. Packed to the brim with people we were all anticipating what food would be bestowed upon us and it wasn’t too long before the aromatic spices wafted through from the kitchen and landed on our tables. 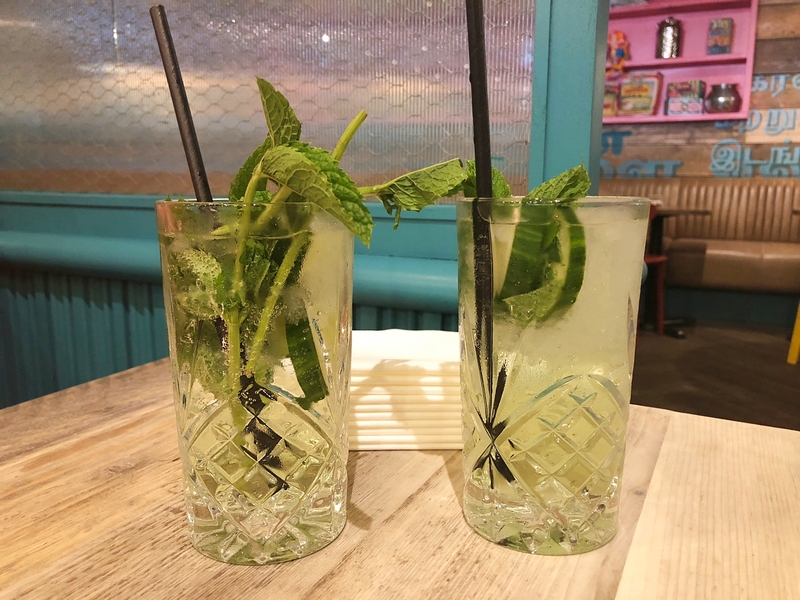 Nothing starts the night off than with a cocktail! To my surprise I have never had a Tom Collins, and this twist on the classic with cucumber and elderflower was the stuff dreams are made of. Accompanying my sugary sweet drink we were offered poppadoms, chutneys, pakoras and these little crisp balls of freshness called Pan Puri which are an Indian street food fave, and I can see why. A side note here, I would have preferred the starters to have been on each table to save waiters jumping from table to table, and would have eliminated the need to use napkins as plates. Trying to scoop soaked in chutney off a napkin is a lot harder than it seems! What would also have helped was little place cards explaining what dishes there were, it got pretty noisy in there which made it impossible to hear what each dish was, or know how many dishes to expect. Thankfully the other starters and mains were impeccably served in little dishes. Pretty as a picture you absolutely could not knock the presentation and I can only imagine the real plate looks even more incredible. I haven’t the foggiest what this side was here but it was SO blooming good I am still dreaming about them now. Fruity fresh fruit and yoghurt topped a triangle of filled pastry that seemed a cross between a palate cleanser and a dessert. 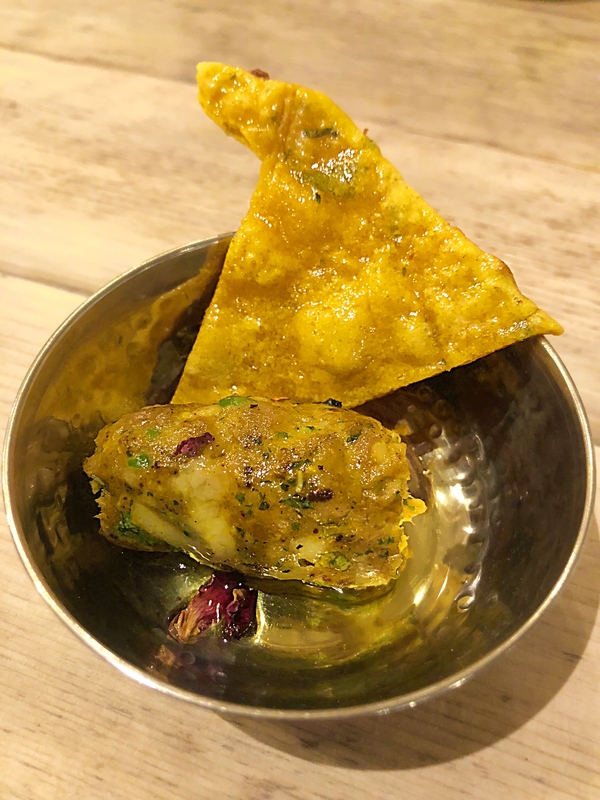 The crisp brown crab bhajis were matched with a cool butternut squash shroba, and surprisingly the hot crab and cold squash worked wonderfully. I am not ashamed to admit that venison is one of my favourite meats, so to see a kebab excited me. It certainly had a kick to it but the spiced nature to it made it too overwhelming for me and the meatiness was a bit lost. Based on the other dishes we had that evening this was my least favourite, but the others certainly made up for it. I don’t know about you but when I have a curry a Korma doesn’t even come close to being on the list. From experience a Korma has been bland and lacklustre with not a single Indian spice in sight. Not at all what I want from a curry. This Chicken Korma has dispelled this stereotype and was everything and more. With the slightly charred juicy breast of chicken, it was hands down the tastiest, fragrant and most delicious Korma I have EVER had. So much so I would 100% order this as my main without a second thought. I think it is safe to say that the food was out of this world and it is certainly tempting me to go back there to try a full on meal. I have never had side dishes or starters from an Indian restaurant that aren’t the usuals so it was a real treat to try something new. Basically The Chilli Pickle is turning the Indian cuisine most of us know, on it’s head and I couldn’t be happier about it. The prices are more on the expensive side of things, but if this taster evening was anything to go by, I think it could be well worth it for a treat. *I was invited to this event by Samphire Communications. All opinions are my own.